The longer you pursue long range shooting, the more you realize that maximizing your time in the field is one of the more important aspects of your advancement as a shooter. If you've not grown tired of sending volley after volley of 5-round strings into a single known-distance target... then you likely aren't going to be willing to receive the importance of the message conveyed herein, and should stop reading now. On the other hand, if you are looking for a guide to making the most out of every trip to the range or shooting expedition, this will be the article for you! Anyone can lay down behind a rifle and send round after round to an IPSC target at 800yds from the prone position. However, it takes an entirely different caliber of shooter to make a first round hit on that same target with regularity in nearly any condition. Better still is the shooter that can do so while being in a less than optimal firing position. I'd wager that the best shooters, are those that can do the above with a standard 308, and not some hot new cartridge or large magnum. The fact is that a shooter will never achieve such proficiency unless they dedicate themselves to a level of training that is consistently challenging their skills and always pushing them outside of their comfort zone. Such training exists in only the finest precision rifle schools and is provided by the military. Though given the current economic climate, many may not have the cash to devote to a high quality school. Also, there are many shooters whom are serious about becoming excellent precision shooters, but have no interest in becoming a soldier and training to be a legitimate sniper. For these people, the availability of guidance is severely limited. Their main resource is the Internet, with its vast array of articles, reviews, and forums which provide them with an endless stream of qualified and unqualified opinions on every subject. To the untrained eye, it would seem that the many forums would be the best and fastest way to gain knowledge. However they quickly realize that the signal to noise ratio on most forums is so high that they spend more time quantifying and qualifying information than they do assimilating it. With precision rifle shooting popularity on an ever increasing rise, the sea of uninformed and unqualified opinion present on the Internet is increasing at an even faster rate. The direct result from this lack of experience shown by the majority of forum posters is that new shooters have absolutely no reliable baseline of which to measure their progress. They see countless 1-hole 5-shot groups, and countless more stories of 1/4 MOA 5-shot groups at 1000yds and beyond. The shooter could spend thousands of hours behind the keyboard reading every forum and article based on the topic of precision shooting and become a expert in the theory of shooting precisely and accurately. Yet no matter how much time the shooter spends reading, most fail to realize the simple truth; The mere acquisition of knowledge is easily accomplished, yet completely without merit unless used wisely in the application of action! Even here on the Primal Rights forum I notice a serious absence of quality time behind the trigger. While I realize that the level of commitment someone has to shooting is not unlike their level of commitment to anything else in that they choose their own level of involvement, but one would think that communities founded almost entirely on the premise of squeezing the trigger would yield a much higher volume of recorded fire. As it is, coaxing people to go out and shoot seems to be a futile enterprise. They always seem to have something else more pressing... yet many of those same people question why they are unable to attain the level of skill they seek. Whether you are a serious and dedicated shooter, or just a fair-weather plinker that likes to get a few rounds down range every few months, the course of fire I'm going to describe in this article will propel your skill set upwards with a velocity that your method of teaching yourself to shoot will be forever changed. From that moment on, when you read about shooting, it will be about specific aspects of deficiencies that you've identified in yourself or in your equipment. A focused desire holds no equal in its ability to produce consistent results. Enough of my ranting, lets get to the meat of it! The PDF download is designed for databook use. Cut it in half, and put a 3-hole punch to it. If you are not using a databook, stop being lazy, get serious, and get going on one. This may look familiar to those of you active on the forums. I've been working on this score sheet for a few months, and tweaking it as we've been testing it in the field. It may yet continue to be polished and refined as we identify improvements. As it stands it is very functional and effective at identifying weaknesses in both the shooter and his chosen equipment. Since we've been exercising this method, three optics from two of the top manufacturers in the $3000 price range have exhibited failures. Shooters have identified the need for a change in their gear in one outing, that was not identified in 20 previous shooting sessions. This truly is one of the best ways to enhance your ability. Yet in order for it to work, you must do it, and frequently. The first consideration is the course setup. In order for this course of fire to be of any value, multiple targets must be used. A minimum of 4 is a good rule to abide, with a maximum of 12 targets total, simply because that is all that the space would allow on the databook page! Target size and variety is completely up to you, but it is best if you get creative and use your imagination. A mixture of circular, IPSC, square, rectangle, and breakable or explosive targets really makes things exciting. If using the breakable or explosive variety, you'll want to ensure there are enough available for every shooter and that the presentation for that stage be identical for all shooters. The targets should be placed at varying distances and locations throughout the terrain to ensure that when a new target is called the shooter is always forced to change position slightly, as well as use a completely different firing solution. Having two targets at the same distance in the same direction will be of little value. However, if you had one target at 600yds in the 10 O'clock position and another target at 600yds but in the 2 O'clock position, it would be of value because of the necessity to adjust position and possibly account for a different wind call. Have fun with it! Put targets behind brush or obstacles so that they are only partially visible. Suspend targets above the ground to make it difficult to spot impacts. Hostage targets are a great addition, as they allow you to penalize a shooter based on a missed shot. If they miss, they receive zero points. If they hit the HT (hostage taker) they receive 20 points. If they hit the hostage, they will be docked 25 points! This is easily accomplished by simply writing a "-25" across the shooter's score column for that stage. Once you have multiple targets deployed, you can begin your session. The lower right-hand block on the databook page is where you identify your targets. You'll see a column of numbers one through ten as well as A and B. That is simply the target number. To the right is a column identifying the size of the identified target. To the right of that are two columns for range to target. The first is the range estimate. If you are having any unknown distance targets, this will allow the shooters to record their estimate. The next column is the actual range to target, so score keepers as well as shooters can record the actual range to target if it is provided. The next three columns to the right are for the shooters to record their DOPE when engaging the different targets. The Path column indicates the shooters chosen come-up to the target. The "actual" column is for the shooter to record the required come-up to contact the target if their initial figure was wrong. Drift is quite obviously the shooters wind call. The A and B rows for target identification can be used as additional targets, or as bonus targets with a higher point value than the 20pts or 5pts awarded during earlier shooting. On the top row of the databook page, you will see standard fields for entry of date, time, location, and atmospheric conditions followed by a blank field for miscellaneous use. On the rows directly beneath it you will find fields for the shooters name or call-sign and another blank row for identification of the cartridge that shooter is firing. To the right of that there are blocks for lighting and wind conditions as well as mirage. On the left beneath each shooter is a series ten 20 and 5 numbers in separate columns. This is for keeping track of a first, and second round hit. As you may have guessed a first round hit is worth 20 points, while a second round hit is worth only 5. It stands to reason that the shooter with the most first round hits will have a much easier time being the victor. 1) Take turns selecting a target. 2) Select targets in sequence. 4) Use the last digit in the current time. If it is 2:23, you would fire on target 3 and so on. The method in which you select targets is not important. What is important is that you never shoot the same target back-to-back. Once all shooters have engaged a target, a different target must be selected for the next round of shooting. This is to ensure the shooters firing solution is no longer valid between each round of shooting, thus forcing the shooter to rely heavily on his holds or turrets to engage targets effectively. 1) Sequentially by shooter number. 3) Location in the alphabet of a chosen initial of the shooters name. 4) Token - Shooter 1 goes first, then the next round, the next sequential shooter fires first. Again, the sequence in which the shooters fire is unimportant. What is important is that no shooter is allowed to fire more than 2 shots at the target, and that every shooter engages the correct target. You can penalize shooters who engage the wrong target by the automatic disqualification from that round. If they fire on the wrong target with their first round, hit or not, they score zero points for that round. This ensures the shooter has their head in the game and will gain the most value from the session. If they are firing on the wrong target, obviously they are not paying attention! If you like you can create a range card after the targets have been identified to help ensure you do not engage the wrong target. Here is an example of a completed Master the Conditions page. As you can see, there were a variety of targets used as well as bonus targets with their point values identified. Pretty straight forward. If you complete the entire score card, each shooter could have fired a maximum of 24rnds at the various targets. Obviously if the shooter engaged the wrong target a few times, their round count would be lower as a result of only firing one round before being disqualified for that stage. The number of shooters participating has a direct bearing on the overall effectiveness of this course of fire. If you are shooting this course by yourself, you could run through it pretty quickly even if you had 12 different targets and never engaged the same target twice. The more shooters you have, the more time that passes before a shooter is allowed to fire again. During this time the environmental variables can change drastically which will force the shooter to read the conditions correctly for each new target selected. It is very easy to fire and miss, then spot your impact or trace, and adjust for hits on your next 4-9 shots. It can be done at almost any range with any cartridge capable of making the trip. The spotted bullet takes all the guess work out of what the wind is doing downrange. That is why a second round hit is only worth 5 points. The skill it takes to put shot number 2 on target is substantially less than the skill it takes to put the first round fired where it needs to go. Another inherent benefit of this exercise is time spent behind the rifle. A new shooter looking to get into precision rifle shooting will often get sore from contorting their neck in the prone position while trying to maintain a sight picture. This results in lack of proper form and bad habits developing due to the shooter giving in to discomfort and heading back to the house. Shooting with a group helps eliminate this factor simply because the pressure the group can apply to keep the shooter firing might be just the push he needs. In order for a hit to be declared, the shooter must have a majority vote of all shooters. If there are an even number of shooters, and a stalemate is reached, you can resort to flipping a coin or something. This necessity requires all shooters to be in position on their rifles to spot and confirm the shooters hits throughout the entire course of fire. The shooters which experience discomfort first or start rolling and hopping around like a frog on a hotplate the soonest, obviously have issues to work out with their firing position. Either that or they just need to train their bodies to handle the stresses of being embedded on the rifle for extended periods. This takes discipline, and this course of fire requires them to practice that discipline heavily! That being said, it is not uncommon for us to take a break and stand up after the 5th target has been engaged. If you are looking to make things more difficult, you can introduce positional shooting and time limits on a per target or per round basis. For instance, you could specify that once the target is designated, shooters will have 1 minute to come up with a firing solution and put it in their optic. After that time limit is passed, no shooter can touch the knobs on their rifle's optic. Then each shooter will have 10 seconds to fire on the selected target when they are called upon. The actual time limits imposed can be modified to suit the experience level of the shooters or the difficulty desired. You can also require certain targets to be engaged from firing positions other than prone. For instance, the shooter may engage the 1000yd IPSC in the prone, but the next round a different target is selected and must be fired upon from the kneeling position. The exact equipment allowed can be further restricted to increase the difficulty even more. Not allowing the use of slings would be an example of this. Leader: "Target Designate - Target 2, Target 2"
Shooters would then be given time to find the target, range it if necessary, and put the firing solution into their rifles. There may or may not be a time limit. Leader: "Shooter Designate - Shooter 3, Shooter 3"
In the case of a rolling or sequential designation, the shooter will likely know when they are up or can be told by the group. Shooter 3: "Shooter 3 ready"
Spotter 1: "Spotter 1 up"
Spotter 2: "Spotter 2 up"
Spotter 4: Spotter 4 up"
At this point, the designated shooter has been clearly identified, the spotters are in the scope, and the shooter is cleared hot. Shooter 3: "Firing" - Shooter will then fire his two shots on target. The shooter will call out "firing" just before they are to fire to ensure the spotters are focused on the target. Obviously in the case of a time limit being imposed on the shooter, this will likely not be required or possible. However if no time limit is imposed, some shooters will take a long time to squeeze the round off, which can result in some impatient and fatigued spotters! Upon that shooter firing two shots, a new shooter will be designated, and they will engage the target. The new shooter will declare "Ready" while the spotters will declare "Up" and this will repeat until all shooters have engaged the designated target. After all shooters have engaged that target, a new target will be selected, and the sequence will begin again. Upon completing the course, you can tally the scores and see who came out on top. Obviously if 3 guys are using 308's and one guy is using a 338LM... the results must be taken with a grain of salt. Be that as it may, the data each shooter can collect in terms of the actual path and drift of their cartridge in the conditions present that day will be of incredible value. 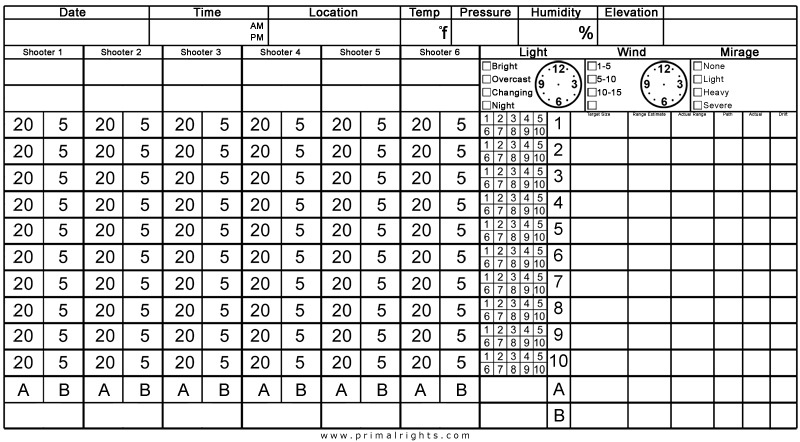 For this reason, each shooter should record all scores and data using the provided databook page. This also helps with any discrepancies when it comes time to tally up scores! If there is a tie, it can be left a tie, settled on the range, or any manner of other ways. The great fun and usefulness of this course of fire lies in its ability to adapt to virtually any kind of shooting and any skill level of shooters, yet no matter how it is set up or what rules applied, it will provide great value to all who participate due to the inherent time it takes to complete as well as the requirement for data collection. It could be done with rimfire's at close distances, or with big-bore rifles at ridiculous ranges. It can be done on a square range, or rugged mountain terrain. The level of difficulty and complexity is completely up to the shooters, yet due to the target engagement requirements it will always provide a challenge if done properly. Next time you go out shooting, give this course of fire a run through. I'd love to hear your feedback and the experiences that you'll draw from doing this kind of shooting on a regular basis. If you want to become a proficient shooter, you must train proficiently. Without proper training, your skill level will stagnate as sure as you are reading this sentence. As the saying goes, "Average people train until they get it right. Champions train until they can't do it wrong!" Now get out from behind that keyboard, get out there and shoot, and see if you have what it takes to Master the Conditions!